How do you choose a bottle of wine from a wine list? Last night I was in charge of choosing the selections for the table as I joined a large group of co-workers (about 12). The wine list: just the way I like 'em... LARGE! 1.5 L Ken Wright �Savoya� Pinot Noir, Willamette, OR 2005 - Chose this larger sized bottle to get the party started... and it delivered! Nice and smooth... a real crowd pleaser. Grand-Puy-Lacoste, 5�me Cru Pauillac 2003 - Since I recently visited this Chateau, I thought this bottle would make for some interesting conversation. Vedict: it did! However, this was the group's least favorite selection. I think this region of Bordeaux is more of an acquired taste for some people. Casa Lapostolle �Clos Apalta�, Colchagua, Chile 2004 - The winner of the night. I have to say that I think that people who don't drink a lot of wine, enjoy those bottles that just SCREAM at them. I thought this one was good, but there was just so much going on, it almost gave me a headache to drink it. Now, get this...The ONLY reason why I chose it was because I recognized the name from none other than Wine Spectators Top 100 list of last year. Is that lame? Overall, it was a great wine experience but do you think I would have done better with another bottle on that list? How would you have decided what to pick? Love the picks, wish I would have been there. Williamette Valley produces my favorite Pinot this side of the pond. The Bordeaux pick is a good choice as well, 03 was a remarkably hot year in Bordeaux and consequently drinking better than most younger vintages. Would still probably decanter the crap out of it though. Last pick is a notible maker from a region know to produce crowd pleasing wines. Bravo! I wish I could've been there to experience these wines. To be honest, if I'm in charge of picking wine, I go with ones that I've actually had. 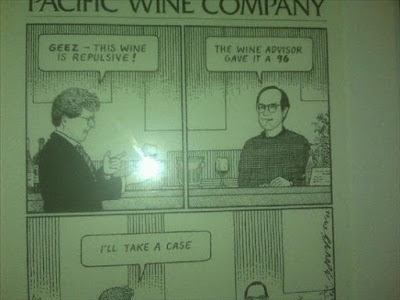 I would hate to look like a putz and order a crappy wine. There is the occasional time I'll recognize something that was favorably reviewed and go with that. Overall sounds like you made some good selections. First, I might have started with some Sparkling wine, such as the Grower's Champagne or a Cava. I might then have gone for a Spanish red, as there are so many excellent choices there like the Mauro Vendimia Seleccion and Descendiente de J. Palacios Corull�n. And maybe a Brewer-Clifton Pinot Noir. If I was on my own, I probably would try something I had never tasted before. BTW, what did you have to eat? I agree with Richard, I'd have definitely started out with some bubbles. From their list, I'd probably have started with the Schramsberg Blanc de Blancs, a nice aperitif style made from 100% chardonnay. The Chartogne-Taillet Cuv�e St. Anne would also be a consideration. I'm not sure what sort of budget we're working with here. If it were really high, Charles Heidsieck Blanc des Mill�naires Brut, Reims 1995 would have been poured. After that, I can see going with some Yalumba Viognier, a nice alternative for the Chardonnay drinker. It is an awesome value and you'll probably convert a few folks to the beauty of Viognier. For me, I'd be all over the 2007 Eroica Riesling, easily the best Riesling made in the USA (IMHO). For reds, well that is a lot bigger fish to fry now isn't it. I like the idea of a 2003 Bordeaux, which are drinking really nice. I'd have gone with the Smith Haut Lafitte only because I've had it a couple of times and really enjoyed it. For Pinot, I'd have gone with the Morgan Garys' Vineyard. I like Morgan's style and almost always like the fruit from that vineyard. Whew...one could go crazy with that list. Before selecting any wines, Risque Sommelier would have first asked the group if they had any preferences...some do. Next he would have found out what people were ordering. Pairing food and wine can be the most amazing experience...or not! Kevin - LARGE = List, you clever dog you :)Like the start with bubbly idea especially with some beauties on there. Risque - After looking over the menu I would imagine the way to go at this place would be the tasting menu with pairing, although your employer would have to be in a generous mood. You know what's funny, they never once offered to decant the wine!? I wonder if it had anything to do with the fact that we were drinking through it rather quickly... should they have at least offered? Josh, I don't blame you... the funny thing is that I played the middle choice safe by picking the Bordeaux. The irony of which is that was the least favored wine! Go figure! The WS pick was one that I've wanted to try for a while... not because of the score, but because of the region and the positive things I've heard about it. I have to admit, it was good! I really need to get more Spanish suggestions from you Richard... maybe even take a trip to Spain. So far, I've really enjoyed what I've tried... I bet there's some real treasures out there waiting for me! The funny thing, Kevin, was that no one at the table wanted to drink any whites! I bet they would have changed their mind though if I ordered a nice Viognier... then again, if they aren't too into wine, they may not have liked it much. Have you ever tried the Pinot that we had in the magnum? Just curious to hear how it comes with your suggestion! My colleagues love to make me pick the wine. They know I love wine even if they don't know about my secret identity as a wine blogger. We're usually on a fairly tight budget, however, so that makes it more of a challenge. I've got to keep people happy while not breaking the bank. I often get a sense of white/red/both preferences as well as any strong preferences for type/characteristics that are loved or hated. Once I narrow the field, I'm usually then left picking the second cheapest bottle on the wine list within those limits. I rarely leave feeling like I've had an amazing wine experience, but it usually works out fairly well....of course it's a lot more fun when I'm with a colleague who's willing to pick up a big tab and I can have more fun...in that case, on with the bubbles to start! Now, that's a funny point! Do they people who work with you know you're a wine blogger? It's always awesome when someone picks up the tab but this is not an often (if at all) occurrence even for a whore like myself! :) That's why I like to find places with reasonably priced wine lists... that way I can tear it up without destroying my wallet. What's the craziest wining and dining outting you've ever had? Spain is an incredible country! I spent 2 weeks there, touring wineries all over, eating some superb meals. I blogged about all of it, and highly recommend that any food/wine lover visit Spain. That's awesome! How long ago was that? I'll head over to read all about it so at least I can live vicariously through your experience until I get the chance to visit! Back in the fall of 2007.